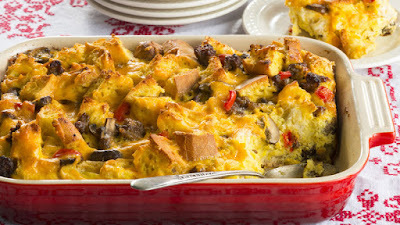 Recipe Source Online: Christmas Morning Breakfast Casserole Recipe - Ho Ho Ho! 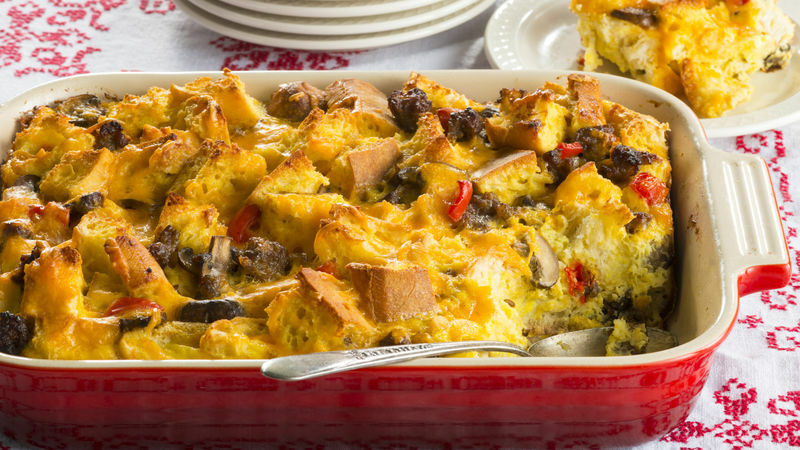 Christmas Morning Breakfast Casserole Recipe - Ho Ho Ho! 1 Heat oven to 375°F. Brown the sausage in a saute pan over medium heat for 3 minutes, breaking it into bite size pieces. Add the mushrooms, bell peppers, 1 tsp salt and pepper. Cook an additional 5 minutes. Let cool. Drain. 2 In a bowl, beat the eggs and milk. Add remaining salt and cheese; stir to combine. 3 Add the bread cubes and cooled sausage mixture to a greased 13×9-inch baking dish. Toss to combine. 4 Pour the egg mixture over the bread and sausage: press the bread mixture down gently to soak up some of the egg mixture. 5 Cover the dish with foil and bake for 30 minutes; uncover and bake an additional 20 minutes. Serve immediately.